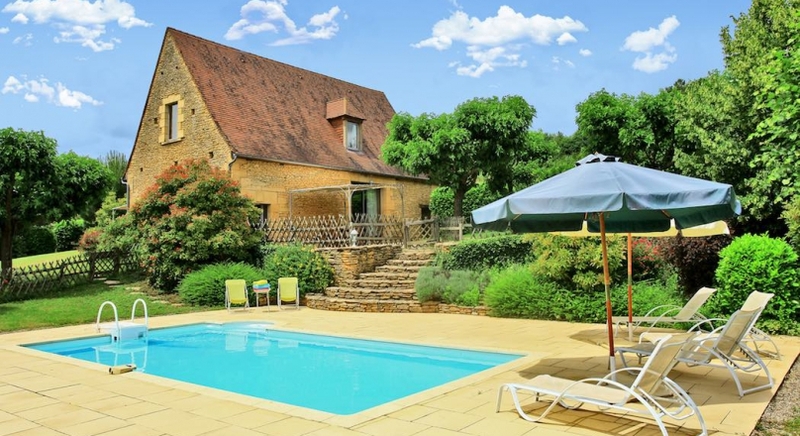 This 120 m2 former barn has stone walls and oak beams is fully air-conditioned. Below it lies a heated and secure private 8x4m swimming-pool with sun loungers and parasols. Th property has two terraces with table and chairs under sunshade awnings - a barbecue is provided. A fully equipped kitchen is open plan with the living / dining room. There is Satellite TV, DVD player, HiFi system. A ground floor bedroom (two 80x200cm electric beds) with it's own bathroom comprising a bath with a shower over it and separate toilet. There is a small lounge upstairs. Kitchen equipment: dishwasher, fridge, oven, microwave, filter coffee machine, kettle, toaster, food processor, vacuum cleaner, washing machine, dry machine. In our rates are included: sheets, towels for the bathrooms and towels for the swimming pool, visitor's tax, VAT, end of stay cleaning, daily maintenance of your swimming pool, swimming pool heating (from June to September) , energies.